The purpose of the Elk Township Historical Society is to promote an appreciation of Elk Township history and its natural environment, particularly the contribution of its one-room schools. Its other purpose is to provide a Community Center offering educational programs for all ages and a place for organizations to hold meetings and groups to hold less formal gatherings, such as showers and graduation parties. A spacious playing field, a well equipped playground and a modern pavilion provide a lovely pastoral setting for family reunions. 1. Replace the leaking shingle roof on the 1870s/1890s wooden school buildings. 2. 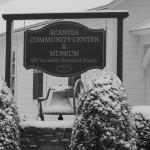 Funding to prepare historical exhibits in the Museums. 3. Funding to improve preservation and storage of historical archives in the Museums. 4. Replace an exterior wooden door on the 1870s one-room school building.